What started off as a hobby has now taken on a life of its own. 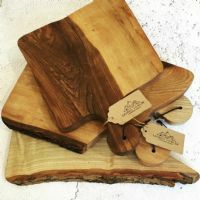 Everything she makes is handcrafted from locally sourced and sustainable hardwood and is finished in natural mineral oil in her workshop (an old hen house) at home, nestled in the countryside in Spa, County Down. Lauren says ‘being able to use such an interesting, earthy material to create something functional but beautiful and in keeping with its natural form is very satisfying’. Her pieces are all one of a kind but at the same time unique!